Hello and welcome back! Here’s hoping that you had a JOYFUL Easter and that you are still celebrating in earnest! After all, we are an EASTER PEOPLE. I thought we would kick off this Easter Season with a podcast I have been meaning to record and send out into the world for a while now: WHY MARY? The first few months of this year, I have been talking about Mary A LOT. Through God’s goodness, I had a pretty special moment with Mary following a terrible tragedy, and that special moment has spurred me on to create a Rosary book and really try to increase Marian devotion to the Rosary. And it has been amazing to see Mary work! So many people have written to me about becoming dedicated to their Rosary again, and I am amazed by how God can use even His lowliest servants. And I completely get it–and used to feel the same uneasiness. Sometimes it feels like a deep spiritual relationship with Mary is in conflict with a relationship with Jesus (spoiler alert, it isn’t). For many of us we think, yes, I was raised Catholic and it feels almost natural to go to Mary with my needs…but WHY MARY? Why bother with Mary when we can just go directly to God, Jesus, and the Holy Spirit. This is an excellent question that I offer some thoughts on this in this episode. I hope that listening helps you understand a little bit more about why God has seen it good and fitting that we take our needs to Mary and why He allows so much grace and goodness to flow through her. I DID NOT record this episode to address Protestant issues with Mary. 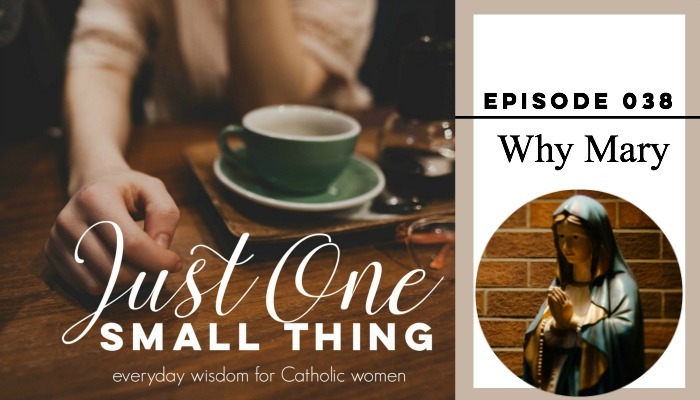 Instead, this episode is meant only to help practicing Catholics refine their Marian beliefs and understand better why we do what we do concerning our wonderful Blessed Mother. In this episode I also reference a few books including 33 Days to Morning Glory by Fr. Gatley which I can’t recommend highly enough. Mary, Queen of Heaven and Earth, Pray for Us! I hope your Lent has been wonderfully restful and fruitful. Mine, thus far, has fallen a little bit short of expectations, but that, of course, is 100% my doing. It is hard for me to embrace quiet, even thought I REALLY need to! In these next weeks, and especially during Holy Week, I plan to really get back on track, find more time for prayer, and set aside some time for really meaningful faith discussions with my kids. 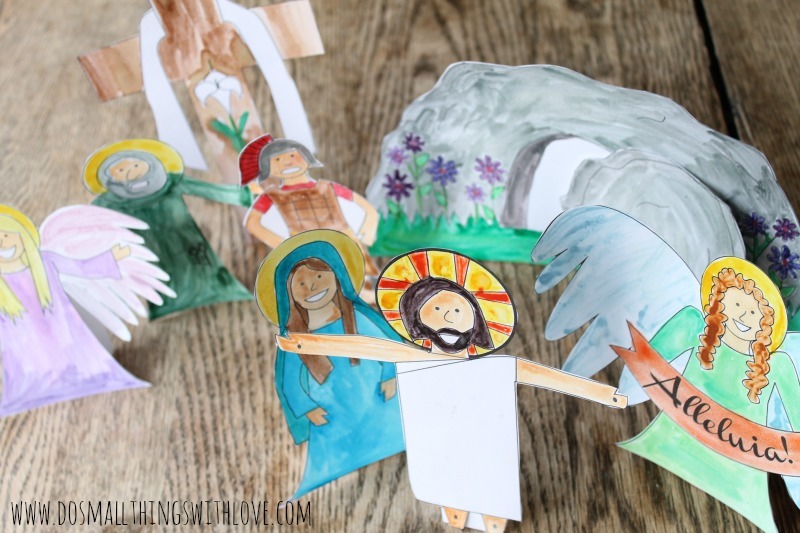 Something we have done the last few Lents is use Finger Puppets to act out, understand and commemorate the events of Jesus’s Passion, Death and Resurrection. I know, finger puppets are a little cheesy, but they are a fun way to help children learn and engage with all the characters in this story. 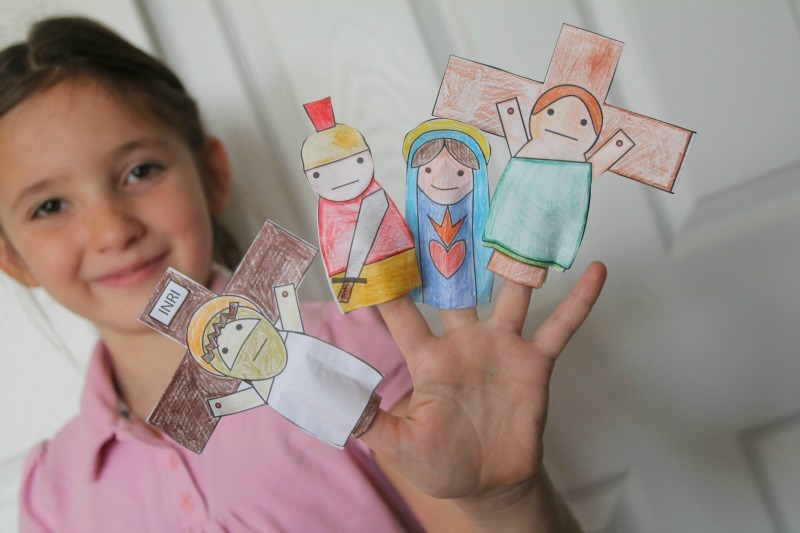 Our finger puppet play is pretty free and easy. Often times the kids want to put on the finger puppets and act out, in part, what we just read or discussed. Sometimes we just set the puppets out on the table and discuss who did way. Either way, they puppets have been a fun faith tool for us. 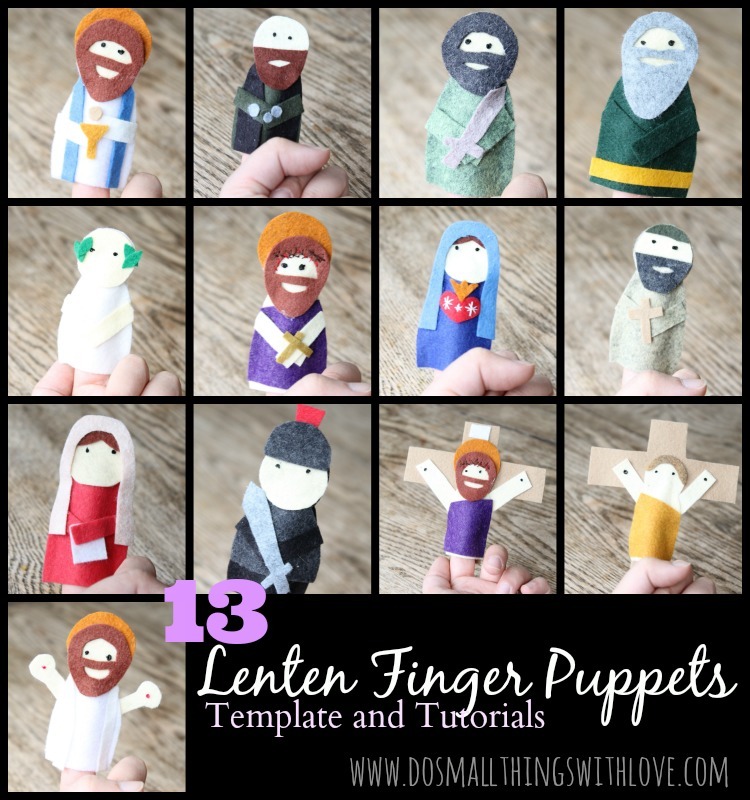 And guess what, I am happy to offer you 2 versions of Lenten Finger Puppets–totally FREE! Just enter your email address right here and I will email the PDF’s directly to your inbox. 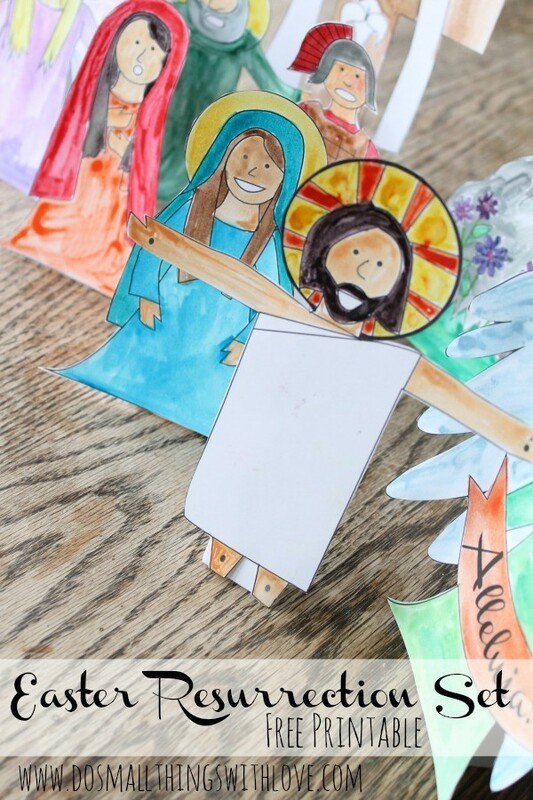 You can find the materials for this project, and MANY other Catholic projects in the Catholic Family Digital Resource Library. To get instant access, and join a thriving community of over 10,000 Catholic Parents, just enter your in your email address. The first set of finger puppets are ones that you can easily print, color, cut and glue together. My only word of advice: make sure to either place a really thin line of glue around the edges, or use clear tape…or else the finger puppets will be too narrow to fit your finger into! The characters included in both sets are: Jesus at the Last Supper, Peter, the High Priest, Judas, Suffering Jesus, Simon of Cyrene, Mary, Pilate, Christ on the Cross, the Good Thief, Veronica, Roman Solider, and the Risen Christ. Which puppets do we use around here? BOTH! Yup, a few years ago I made all of the Felt Finger Puppets, but my kids are at a stage where they really love creating their own things. So, while I still use the felt puppets, I have a strong feeling that we will be making a new paper set this year–and maybe a couple paper sets! I really love making the paper sets, actually, because the kids always ask SO many great questions as we are coloring. Questions like, why is Judas holding money? Who is this other guy on the cross and why is Mary’s heart like that? So many great moments for Catholic instruction! 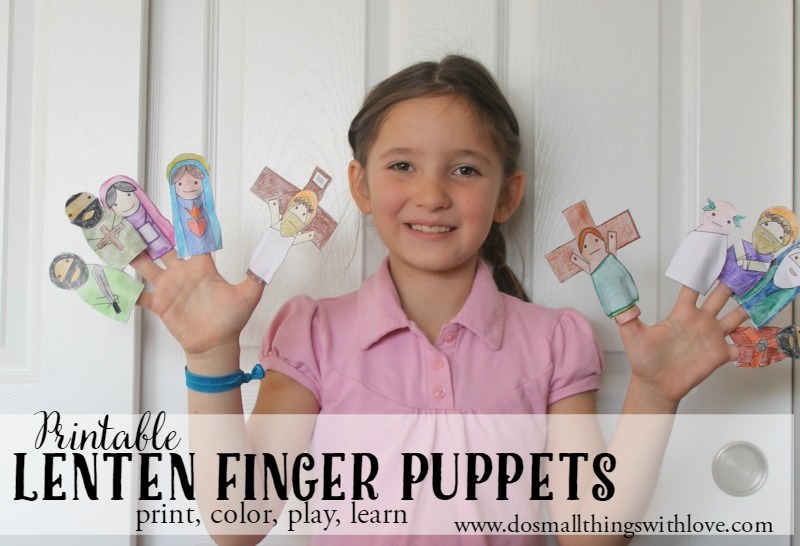 So, if these finger puppets would be helpful, I encourage you to download and use them! 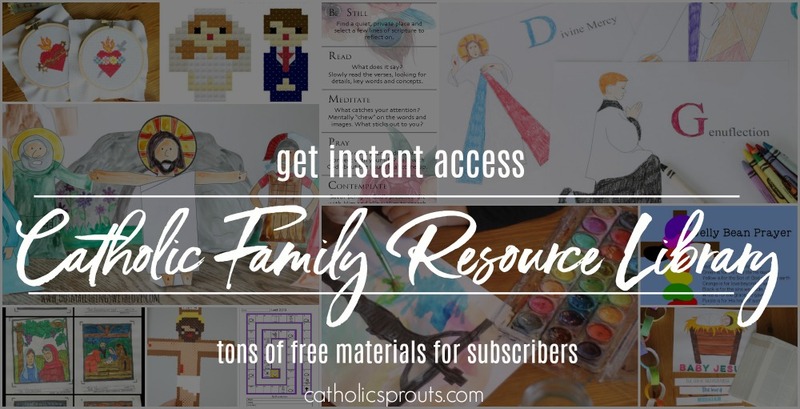 Once again, you can find the materials for this project, and MANY other Catholic projects in the Catholic Family Digital Resource Library. To get instant access, and join a thriving community of over 10,000 Catholic Parents, just enter your in your email address. I hope you children love these puppets and learn as much from them as mine have. One of the most enjoyable parts of blogging for me is being able to meet people with whom I have so much in common. Yesterday’s post on the sickness of pregnancy certainly brought this into focus, but on a much more casual level, through the blog I have met other cross stitch lovers–and that is so fun. Cross stitch might be one of my favorite pastimes. It is so easy, stress-free and I can do it while watching TV, because I don’t know about you, but I can never JUST sit and watch TV. I always feel like I have to be doing something as well. In fact, when the weekend rolls around and I know my husband and I will likely be watching a movie at some point I go a little nuts if I don’t have a little hand-project to work on. It’s silly, but having something just this side of mindless to work on with my hands makes me a better companion. I can actually relax and give up 2 full hours to sitting in front of the television. And so, here is the fun little project I worked on this weekend. It is simple, easy and I am excited to hang it in my house after we are done with Lent–because of course this is the word we all avoid saying this time of year! I’m into these modern fonts right now, so I wanted to use that for the pattern. The pattern is totally free. I designed the pattern using only black and white thread, but you can of course use something more colorful and “springy”. So, if you too long to have a little project to work on while spending time taking in a movie, here you go! I am already scheming my next project, so that I can once again sit and have some quality time with my husband this weekend. 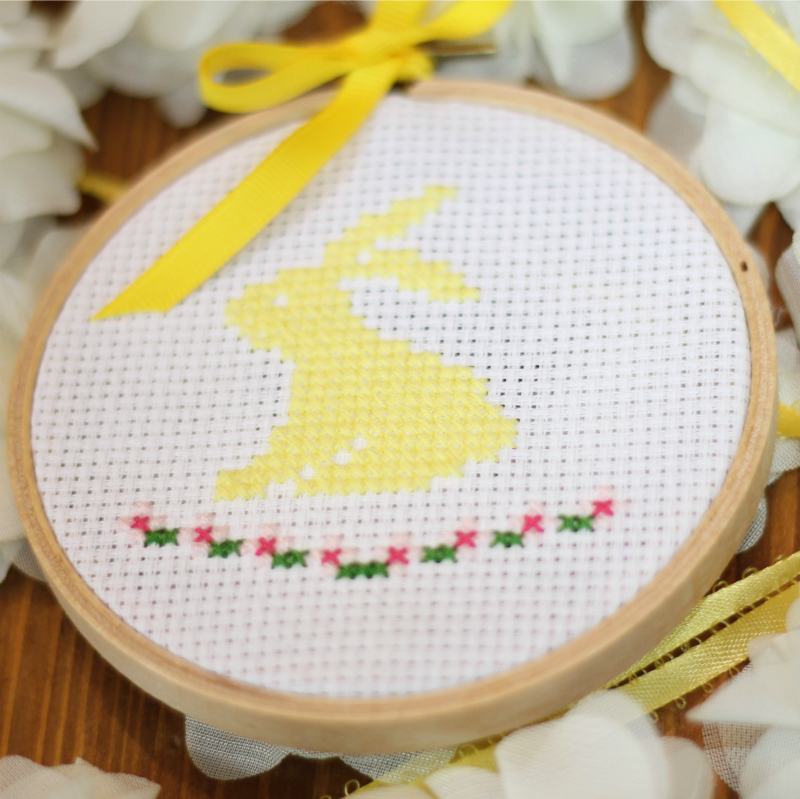 Today’s project–a spring bunny cross stitch pattern–is a simple pattern that I just love. Isn’t this little bunny cute? It’s a quick project (as far as cross stitch projects go) and has a folksy flare. 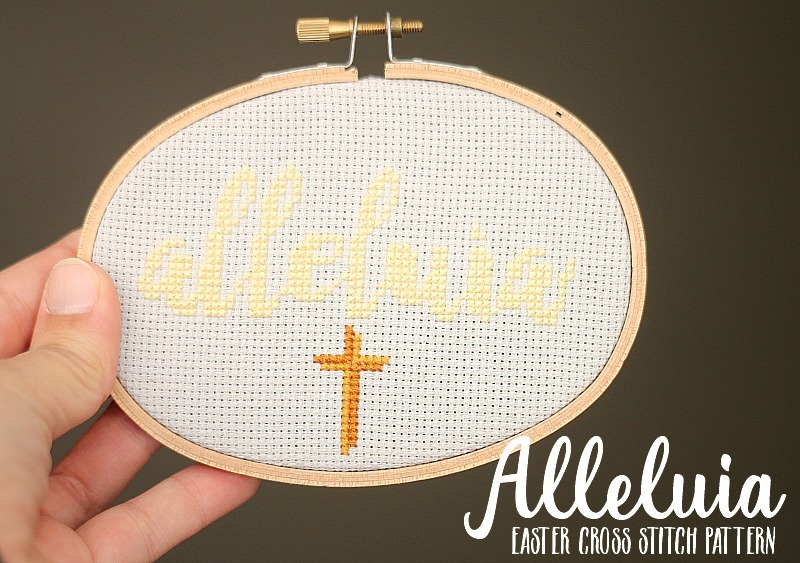 Plus, I created a free pattern for this cross stitch project. So, it’s time to get stitchin’ and gearing up for spring that seems to finally have sprung around here. Here is a closer view of the cross stitch pattern for this project. You can, of course, choose any color or color combination for this project. The PDF of this pattern (link above) refers to colors by name, but feel free to ignore that (I usually do!). Cross stitch is the most basic and elementary type of embroidery. In fact, I recently had the joy of teaching 2 of you my nieces (ages 6 and 8) to cross stitch. With some practice they will have pretty much mastered the art of cross stitch. I learned to cross stitch as a girl…and all these years later I still enjoy grabbing a cup of tea, putting my feet up after the kids are in bed and stitching. Cross stitch is just a lot of counting and because of that can be very relaxing. If you are new to cross stitch, don’t worry! Give it a try! 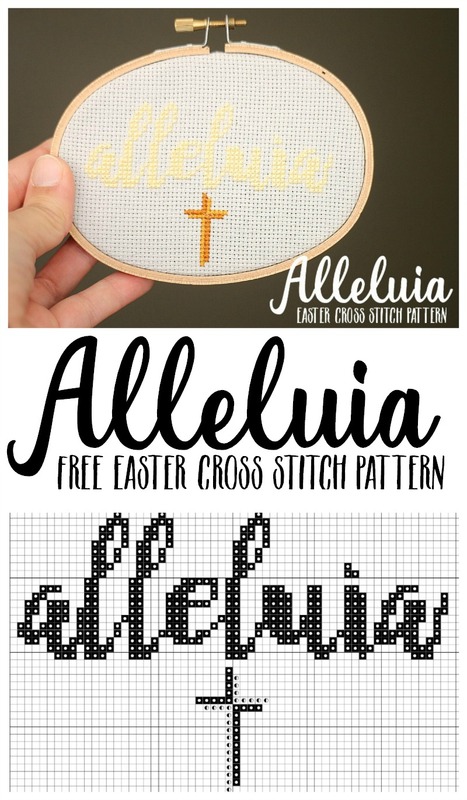 I wrote up a detailed how-to on cross stitch HERE. I don’t think you will have any questions after reading through that! And, if you do, I’d be happy to help! Just leave a comment. My favorite way to display completed cross stitch projects is in a simple wooden embroidery hoop. When you are done stitching simply twist the top of the hoop as tight as possible. Then, trim off the excess aida cloth. Finally, tie a cute little ribbon around the top. 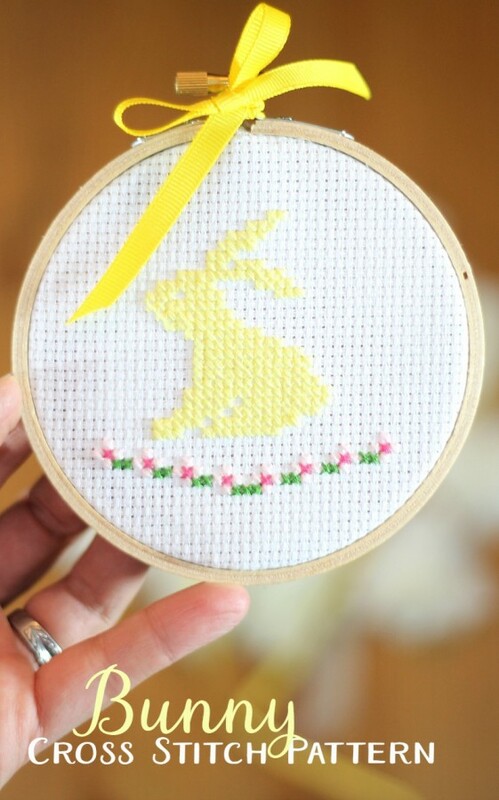 I plan on turning my cross stitched bunny into an ornament for my family’s Easter tree (who says you can only have a tree at Christmas!). That’s the great thing about stitching this project up on 14 count aida cloth. It will turn out little and cute! Hello! 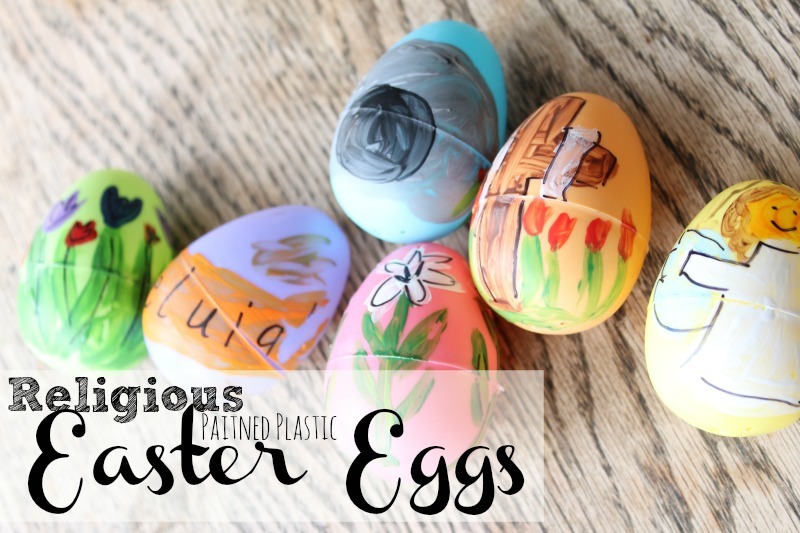 Today I’m sharing a simply (very simple) project that I made for my little guy Gus this Easter: Religious Painted Plastic Easter Eggs. 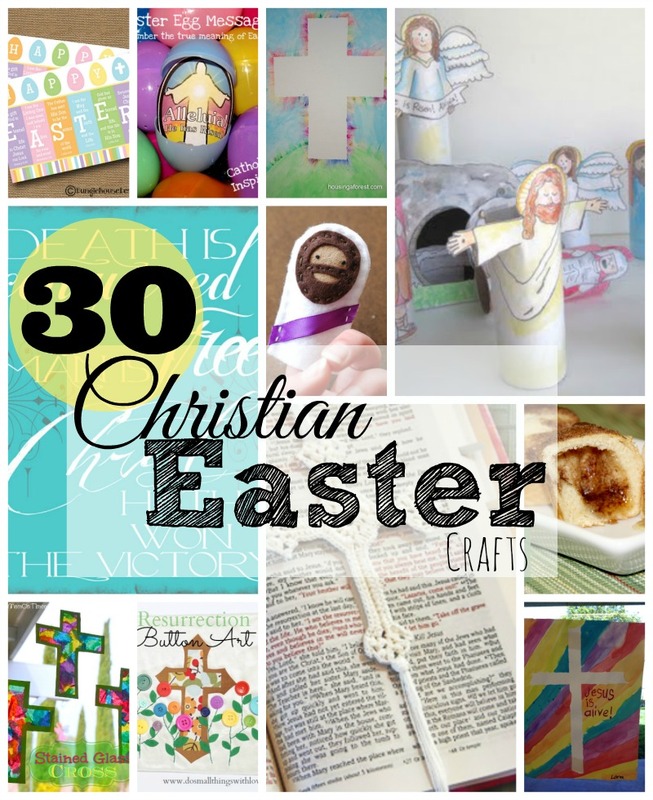 (I seem to be very inspired by my son this Easter season–>> see yesterday’s post). 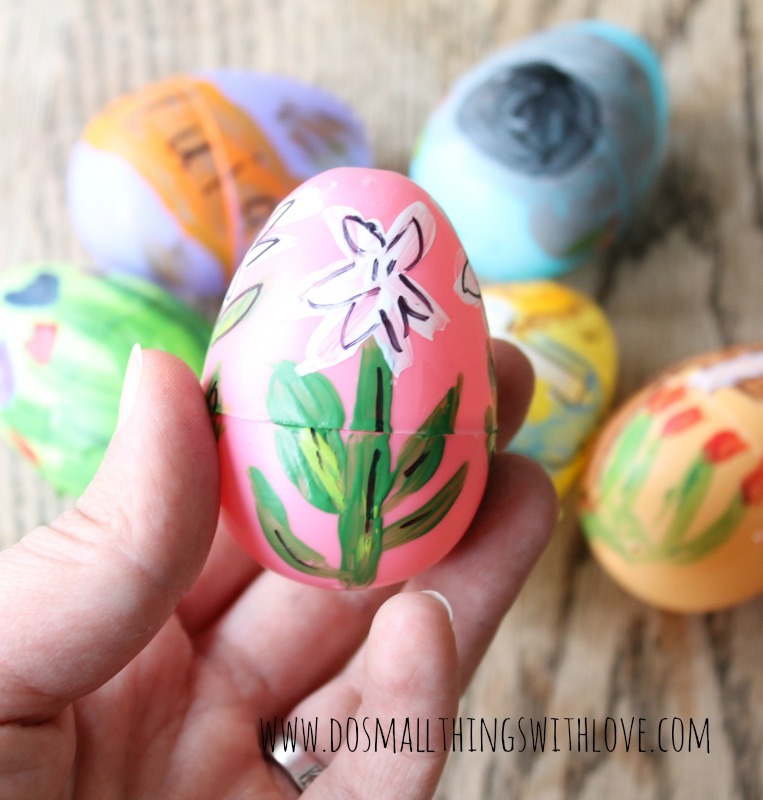 There is really no mystery or shocking how-to here…I just painted some plastic eggs, outlined in Sharpie and they sealed with Mod Podge…but I did this for a very specific reason and I hope it makes at least a small impact on my son Gus. 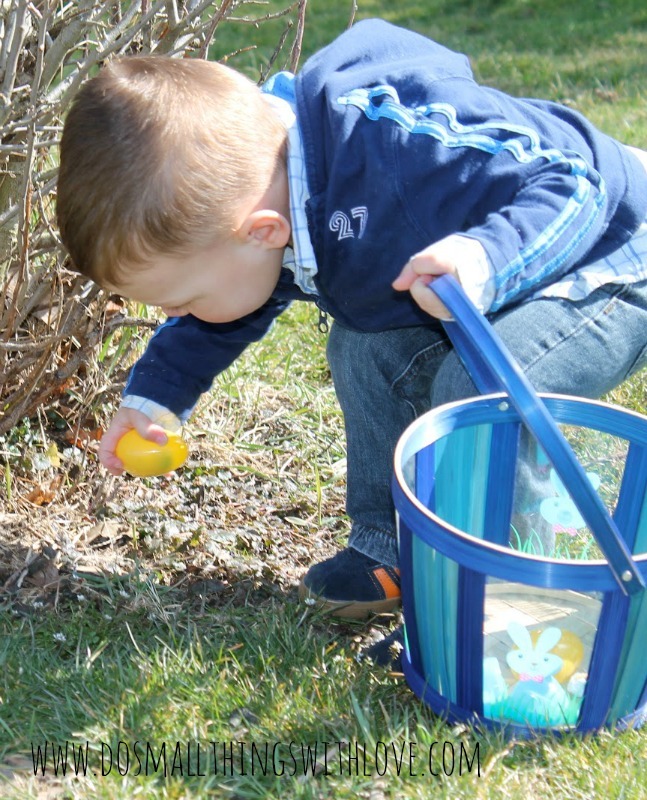 He also understands that Easter eggs are part of Easter…and that they should be filled with CANDY! So, when we bought eggs at the store last week he was thrilled, thinking I would immediately head home and fill them with candy. Instead I explained to him that we didn’t fill them with candy and celebrate Easter until Jesus rose from the dead on Easter. He pondered this, while looking at the eggs but he accepted it. I can tell he’s been thinking about it, this whole Jesus still being in the tomb and us needed to wait until he rises from the dead. Now he’ll point to the cupboard where he knows I have put the eggs and ask, at least 5 times a day, “Mom, Jesus still in the tomb?” and I can simply respond “yes” without having to go into any of the candy-related issues we might have to otherwise. It’s simple, but it’s a start. He is, after all, not even 3 years old. 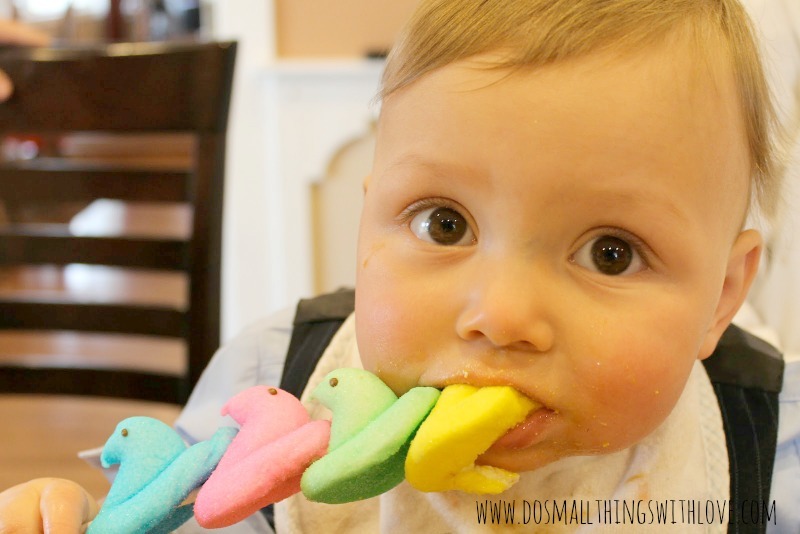 And so, I wanted to keep this connection between Jesus and eggs going, even when we (yes we) are frantically hunting for eggs and consuming copious amounts of candy. 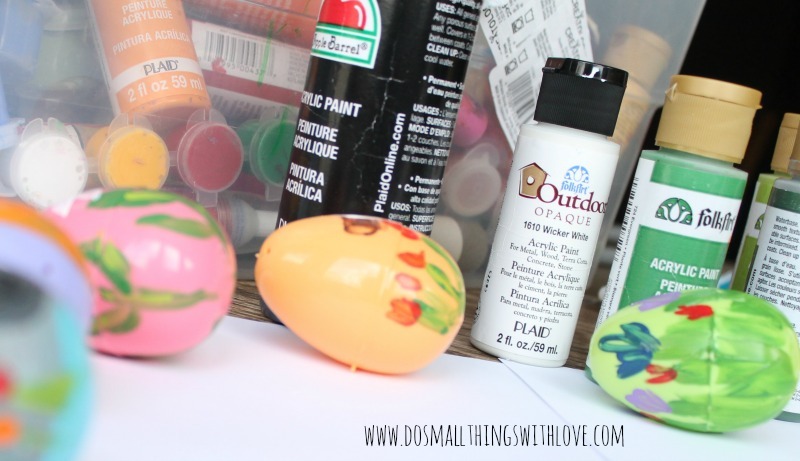 I thought an easy way to do this was to paint Christian images onto the eggs, and try to bring that into the egg-hunting experience. As I said, this is easy, and I’m not going to belabor this! I used general plastic eggs, acrylic paint, a black sharpie marker and Matte Finish Mod Podge. I did a messy/rough image with the paint and then defined it with marker. I sealed it with the Mod Podge. I did all of this with the eggs closed and allowed it to dry. When it was dry I gently squeezed the sides and they opened just fine, without pealing or getting messed up. 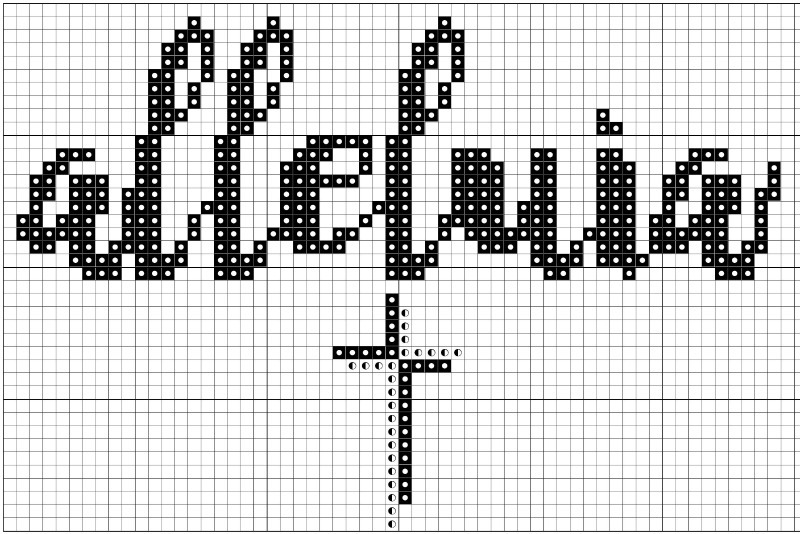 If you are looking to make your own, I did 6 images: Lilies, Resurrection Cross, flowers, Angel, Empty Tomb, and Alleluia banner.